Note − SAP Simple Finance is also called SAP S/4 HANA Finance. With the release of 1605, SAP Simple Finance is only known as S/4 HANA Finance and this will be the only name of other releases of SAP Simple Finance. During the installation of SAP S/4 HANA Finance, various front-end and back-end components get installed. Using SAP Simple Finance, organizations can use it to forecast, plan, and budget as an ongoing process. With the use of Predictive Analysis, you can forecast the impact of business decisions on the financial reports of the organization. With the use of advance Finance and Accounting features, organizations can meet the legal terms and complete the financial reports on time. Using Predictive Analysis, organizations can find the risk in financial processes at an early stage and device ways to mitigate them. It is easy to find the best possible investment rates as per market standards. Using strong financial processes, it is easy to prevent unauthorized access to sensitive data in the organization. It is easy to detect fraud and abuse, and organizations can proactively balance the risk for all the financial processes. SAP S/4 HANA Finance is developed based on SAP NetWeaver and SAP ERP Business suite. Following is the minimum system landscape for backend of S/4 HANA Finance (without SAP Fiori and Smart Business application). SAP S/4 HANA Finance involves ERP 6.0 to be updated to SAP ep8 for SAP ERP 6.0 and it is tightly integrated with other ERP applications like Material Management, and Sales and Distribution. SAP S/4 HANA comes with a simplified data model. The tables and indexes are removed and replaced with HANA views in the underlying database. SAP S/4 HANA Finance uses an in-memory computing power of HANA. To run SAP S/4 HANA, you have to use the latest features of ABAP technology that comes with NetWeaver 7.5. Central Finance is used to transition to SAP S/4 HANA Finance without impacting the current system landscape. Using Central Finance, you can implement a common reporting structure by mapping the common entities in the local system to a common set of master data in the Central system. For data replication from source system to Central Finance, you have to use SAP Landscape Transformation Replication Server. You can use Software Update Manager (SUM) to perform the installation of SAP S/4 HANA Finance and to perform system upgrades as well as enhancement package installations. Note − It is not possible to install SAP S/4 HANA Finance with classical database and you have to ensure that migration happens to SAP HANA before installation. 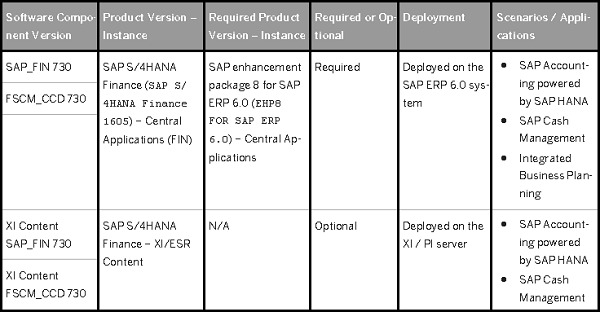 You can’t migrate to SAP HANA once the installation of S/4 HANA Finance is done.